Happy Day after Christmas! Hope that yesterday was a peaceful and wonderful day of celebrating for you. My holiday took an unexpected turn after I ended up staying in Vermont for the weekend instead of going home to Maine (the weather here was less than ideal), but I've tried to remain positive despite this happening! 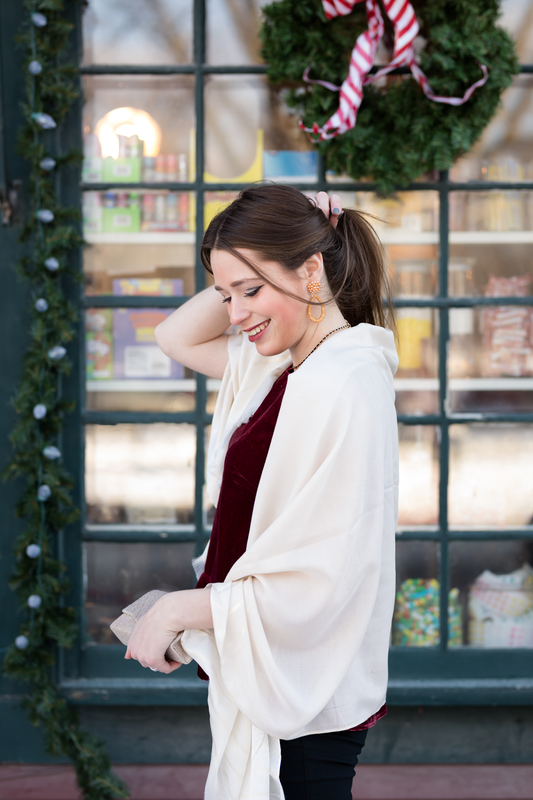 In today's post I'll be sharing one last holiday look that I wasn't able to post before Christmas, and also an updated reading list! I know it's been awhile since I shared one, but I wanted to let you guys know what I have been reading in November and December, before the new year! This velvet peplum top was one of my Black Friday purchases this year, and I just love it! It comes in numerical sizing, but I found it fit true to size. It's a versatile winter top that you could easily pair with a cardigan for the office or school, and you can dress it up as well with a pencil skirt or skinny dress pants (like I did here!) for a holiday party look. This top also comes in a few other colors, and they're also super cute! 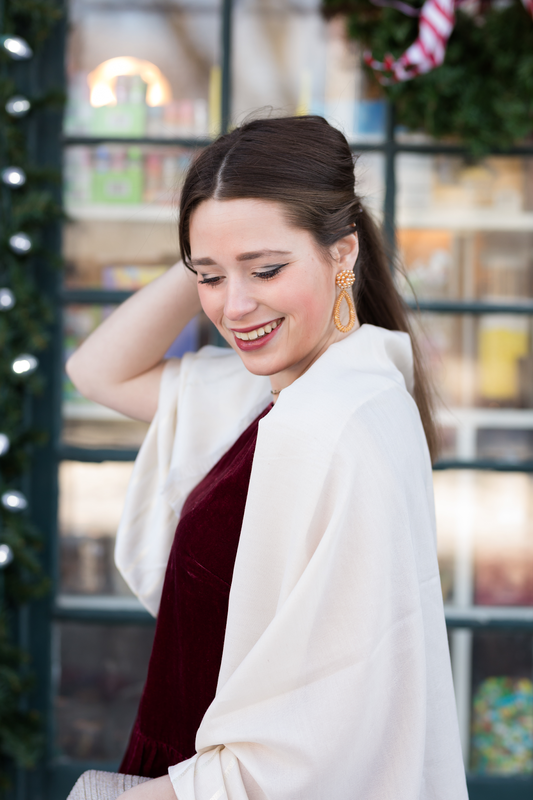 I thought that gold accessories would be the perfect compliment to the dark red of the top, so it was the perfect chance to wear my new favorite statement earrings from Lisi Lerch! They kindly sent me these in time for my Kentucky trip, and I had fun wearing them there too! They're just gorgeous, and I know they will brighten up lots of my winter outfits. By the way- it was 10 degrees outside when Amanda and I took these photos!! I still can't believe I survived. She sure is a trooper! Hopefully my teeth don't look too gritted and you can't see my goose bumps in the pictures. 😊 Quite a note to start to end on for one of my last outfit posts of the year! *Shattered by Karen Robards: This was a thriller set in a small town outside of Lexington, KY. Since I read it about a month before my Kentucky trip, it actually got me super excited to visit the Bluegrass State! Karen Robards does a great job of setting the scene of the Kentucky landscape in the book. As far as the plot itself, I loved the first half of the book, and then found the second half got a bit hard to follow and more unrealistic. This book is about an attorney named Lisa Grant who investigates an unsolved case from almost 30 years prior, which ends up hitting too close to home. There's also a romance involved in the plot as well. *Friendship Bread by Darien Gee: This is a feel-good read all about friendship, small town life, healing, and the power of baking. Thinking of Hallmark Movie type vibes, but in a book! It follows the lives of three women, all living in a small town in Illinois. As the women become friends and a baking obsession sweeps over their town, change is on the horizon for each of them. This was a cute read, and I thought it was so sweet that the author included recipes in the back of the book. *Secrets in Summer by Nancy Thayer: This book is set on the New England island of Nantucket, and the main character is an island resident and librarian named Darcy. The book follows Darcy's life for a whole summer, through her friendships and dating relationships, and also paints a very realistic picture of what it's like to be a permanent resident on one of New England's smaller islands. Although there weren't any major plot twists in this book, I did enjoy the story, and I especially enjoyed the vivid descriptions of summer on Nantucket. I've never been to Nantucket, but some parts of it reminded me of summer in Maine. I'd be interested to read some of Nancy Thayer's other books! *First Comes Love by Emily Giffin: Amazingly this was the first Emily Giffin book I've ever read! I've seen her books before as they're quite popular, but I'd never picked one up for myself before. I really enjoyed this book. It explored the concept of coping in the years after a great loss, and the challenges that come with a relationship between two sisters. I'd love to read more of Emily's books now! *Vanished by Karen Robards: I took out another Karen Robards book on my latest library trip, and I'm actually still reading this one! It's another thriller. This book follows the story of workaholic district attorney named Sarah, whose daughter was tragically kidnapped years prior. The book begins when Sarah is a victim in a crazy convenience store robbery and shooting (which as a warning, is a very graphic scene). Sarah being on the scene of such a great crime leads there to be questions if this could be connected in any way to her daughter's kidnapping years prior. There's also a romance developing between Sarah and one of her best guy friends. I'm looking forward to finishing this book. My outfit details are all linked below. I'm excited to share my first year end recap post on the blog tomorrow! If you haven't read mine from years prior, I always share one post recapping the year in my personal life, and one recapping the year in blogging (as that's a ton to include all in one post!). Here is 2016's personal post and blogging post if you're curious in the meantime! Emily Giffin’s books are always my favorites! I’ve read them all and can’t get enough! My favorite is either Something Borrowed or Love the One Your With. Also, I think you like Colleen Hover or Taylor Jenkins Reid if you haven’t checked their books out yet! Girl I got the shivers when I read 10 degrees! BRRRR! But ya gotta do it for the shot, right? This look is so cute! Happy Day after Christmas! I'm loving your Lisi Lerch earrings! The Kates are my favorite style of hers! I need to check out some of these books! That Emily Giffin book has been on my list for quite a long time haha. Also love that top on you! I bought it but ended up returning it. I loooove Emily Giffin and have not yet read First Comes Love! Definitely going to pick it up next time I'm at the book store. You look incredible!!! Will definitely have to look into some of these books! I absolutely love that velvet top on you! I'm currently reading Dan Brown's new book and it's been really good so far! You can never go wrong with an Emily Giffin book! She is a staple on my bookshelf when I'm looking for something light to read.